The InterContinental® Hanoi Westlake is located on the peaceful waters of the largest lake in the city and is adjacent to the famous 800-year-old Golden Lotus (Kim Lien) Pagoda. Ideally situated just minutes from the Old Quarter, the hotel offers a welcome haven from the bustling city centre. 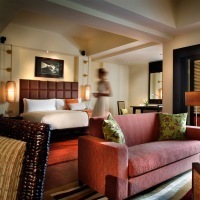 With the combined comforts of the ever-tranquil West Lake, spacious accommodation, luxurious facilities and attentive Vietnamese hospitality, guests will soon discover that the InterContinental® Hanoi Westlake is the perfect place to stay, whether travelling for the purposes of business or leisure. Blending Vietnamese grace with understated service and In-the-Know knowledge, Intercontinental® Hanoi Westlake turns a visit to the City of Peace into an unforgettable experience. Whether it’s rich cultural lifestyle or historical landmarks that attract your attention, it takes longer than you think to explore the best of Hanoi. Spend more time discovering the city and receive greater savings as you stay 5 nights or above. Why not plan your weekend getaway to discover the charming city of Hanoi and experience sublime luxury at InterContinental Hanoi. Our ‘Weekend Special’ package is designed to help you rejuvenate in style with a minimum of 2 nights including breakfast buffet for two and extend your check-out time until 4 PM (subject to availability). 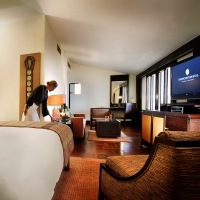 Our 293 elegantly appointed guest rooms and suites are cloaked in a tranquil residential setting. Of these rooms, 132 are located on two unique Island Pavilions set just above the picturesque waters of West Lake. Contemporary Vietnamese design meets spacious intimacy with cream coloured walls and dark timber floors and furniture, complemented by rich textures and vibrant colours. 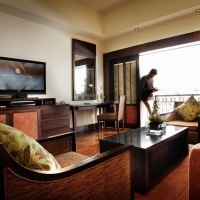 Each room and suite features a private balcony with a superb view of either West Lake or the Hanoi skyline. Starting from 60 sqm, our Lotus, Grand Westlake, and Presidential suites are a beautiful blend of Vietnamese décor that offer generous space for relaxation and entertainment. Comprising of large, protruding balconies with sweeping views, as well as spacious bathrooms with soaking tubs and rain showers, these suites are expansive havens for those who wish to enjoy a unique experience. Suite bookings also include complimentary access to our exclusive club lounge, complimentary Wi-Fi, breakfast, afternoon tea, and evening cocktails with canapés. Very spacious (60sqm) wooden floor rooms that are finished in contemporary Vietnamese design. These king bedeed rooms are located on the highest floor of the main building and feature two private balconies where you can unwind in a tranquil atmosphere with a choice of views over the serene waters of the lake or the city skyline. Each room comes with a separate living area and offers the latest in modern technological amenities, with LCD televisions, a large working desk and high-speed Internet access. Each bathroom also offers double-basin vanities, a deep-soaking bathtub and a separate walk-in rain shower. All guests have full access to the exclusive Club InterContinental Lounge where discerning service and executive privileges are to be experienced. Very spacious (80sqm) wooden floor suites that are finished in contemporary Vietnamese design. These king bedded suites are located either in the main building or on the island pavilions on the lake. They feature private balconies where you can unwind in a tranquil atmosphere with stunning views of the lake. Each suite has a personal coffee machine, and offers the latest in modern technological amenities, with LCD televisions, entertainment systems and high-speed Internet access. Each bathroom also offers double-basin vanities, a deep-soaking bathtub and a separate walk-in rain shower. All guests have full access to the exclusive Club InterContinental Lounge where discerning service and executive privileges are to be experienced. The Presidential Suite is the most luxurious space (305m²) in the hotel and comes with 07 encircling private balconies. With stunning views of the lake and the city skyline, it is an oasis of indulgence that meets the most luxurious of needs. Blending modern elegance with Asian ambiance through exquisite materials, contemporary Vietnam arts, and handcrafted finishes, the Presidential Suite offers a premium experience and service for guests. 01 large & separate dining room. 02 bedrooms including a vast master bedroom. 02 bathrooms including a premium one for the master bedroom. Complimentary access to Club InterContinental. The InterContinental® Hanoi Westlake is located on the peaceful waters of the largest lake in the city and is adjacent to the famous 800-year-old Golden Lotus (Kim Lien) Pagoda. Ideally situated just minutes from the Old Quarter, the hotel offers a welcome haven from the bustling city centre. With the combined comforts of the ever-tranquil West Lake, spacious accommodation, luxurious facilities and attentive Vietnamese hospitality, guests will soon discover that the InterContinental® Hanoi Westlake is the perfect place to stay, whether travelling for the purposes of business or leisure. Blending Vietnamese grace with understated service and In-the-Know knowledge, Intercontinental® Hanoi Westlake turns a visit to the City of Peace into an unforgettable experience.